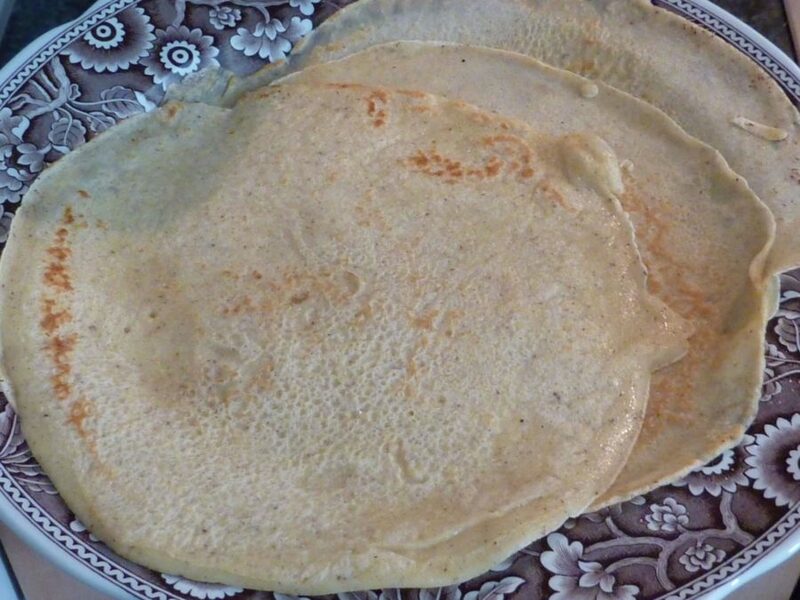 Crepes by definition are a thin, light pancake. There are usually two versions of this, either sweet or savory which makes it a galette. My version here, is the sweet one. I’ve been working with this recipe for almost two decades. It’s almost as great as my special crepe pan, because you need one of those to have the full authentic effect of a crepe. The pan is made of iron, and has a flat bottom with angled sides. This makes it great for forming and flipping the crepe. If you don’t have a pan yet, get one. As they say, with the right tools, anything’s possible. Crepes can be made and enjoyed anytime of the day, but we tend to limit crepe time for breakfast. When you’re planning a nice brunch, or a special weekend breakfast, make your crepe mix the night before. Cut up some local, seasonal fruits and maybe concoct a cream to put in along with the fruit. You can also keep it simple with a bit of jelly and a light sprinkling of powder sugar. So many options, so many flavors. I’ve even seen the crepe stands in Switzerland serving up the crepe with nutella inside! So, the perfect crepe recipe, along with your ‘seasoned’ crepe pan, indeed two partners for life. I would not invest in the electric crepe gadgets out there…you don’t need it! In your heated pan, scoop approx. 2/3 of a ladle of the batter, and pour batter in pan. Make them thin by swirling the pan around. Let it cook on medium heat (from 0 to 9 about 6) until you can easily flip. When ready, flip over for a brief moment, just to slightly tan. Crepes can be made one by one and served immediately, or can be stacked and kept in warm oven until finished making the batter. After each crepe, add a sliver of butter to the pan, let it melt and you are ready for the next crepe. Accompany crepes with sweet butter, vanilla crème, fresh fruit, powder sugar, cinnamon sugar, or fresh preserves. Take it to a dinner meal, and you can serve a creamy meat or vegetable sauce inside the crepe. Makes approx. 20 crepes. We like to put jelly or preserves in the in a long line in the middle, then roll it up like a burrito and put powder sugar with a shaker on top.